Several of Amsterdam’s bridges are now permanently closed because the high temperatures have caused the metal to expand, make them tricky to open and close. 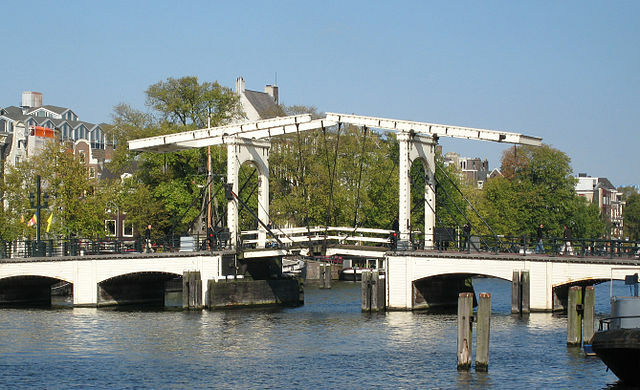 Twelve bridges were closed as of Tuesday morning, including the Magere Brug which straddles the Amstel river. Additional bridges are expected to join the list in the course of the week. Under less extreme water conditions the metal hinges and locks are kept cool with water out of the canals but it has been too warm for too long for this to have an effect, website nu.nl said on Tuesday. Bridge operators are now keeping the bridges closed for the duration of the heatwave. Commercial shipping through the waters of the Dutch capital has been substantially reduced as a result of the drought. The so-called eastern route – Nieuwe Herengracht, Amstel – was closed off on Monday evening. The western Kostverlorenvaart route – Singelgracht, Westerkanaal – remains open for barges and other commercial vessels.